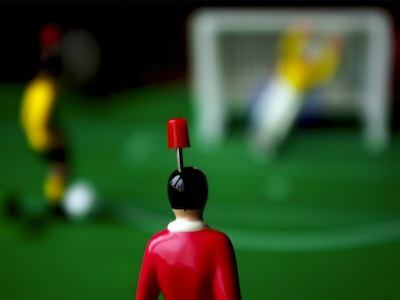 One of the most exciting world cup games was played yesterday between Germany and England, with some controversy. The World Cup is the world’s biggest sporting events and it only keeps growing; as a big football fan I have been following most of the games in South Africa this year and as a personal finance enthusiast I have noticed some parallels between the World Cup and investing. No two World Cups are the same and nobody can predict with 100% accuracy who will win, just because a team performed well in the last World Cup does not mean they will win again. Just look at Italy and France, last World Cup’s finalists did not even manage to qualify out of the group stages. It is very similar in investing, just because a specific stock or mutual fund performed well one year, one cannot expect the same results the following year. Always remember that past performance is not indicative of future results. In every World Cup there are big surprises and shocks, who would have expected Switzerland to beat Spain or Italy to be knocked out in the group stages? Big shocks is just part of the game and that’s what makes it beautiful. Five years ago nobody would have expected Lehman Brothers to go bankrupt or AIG to be on the verge of bankruptcy, but it happened. Nothing is for sure; do not be surprised if your “sure” investment goes belly-up. Be prepared for anything, the unusual is possible. Football is a team sport. There are great players like Messi and Podolski, however alone they cannot achieve anything. It’s always about a team effort and unselfish acts. Everybody on the team has to carry their own weight and be responsible for their tasks. The situation is similar in investing and personal finance, it’s a team sport. The involved parties could be spouses, investment advisor and even children. All parties have to contribute their share in order for the plans to be successful. Defense. Defense. Defense. Scoring a goal is a whole lot harder then conceding one. A strong defense is a must in order to win. Looking back at almost every World Cup winner one common element is strong defense. Without a defense the team is hopeless. Over the last two years most investors have learned the importance of a strong defense. Everything is great when our portfolio is enjoying substantial gains, but things can fall apart in a matter days. It often takes just a week, or even less, to destroy gains of over a decade; and it may take another decade to recuperate all those losses. A strong defense is vital in an investment plan as without it your portfolio is hopeless. Patience is critical in football, rushing the ball down the field and taking long shots will never win you a game. Just ask team USA who needed a win in the last group game against Algeria to move on and it took them 91 minutes to score the goal. Patience is also critical in investing, trying to time the market and make a few quick bucks will not ensure you a comfortable retirement, but patience and discipline will go a long way. World Cup is about a lot more then just football! And don’t give up when things look bad. You can have great financial comebacks! (Okay it’s a lot like your patience one). But thinking positive and acting positive can do wonders for your financial self esteem and can help you reach your ultimate goal (pun intended). Nice analogy and a really fun read! Ray awesome post idea. You made a lot of great points. I especially love the point about a strong defense. To add to that as well, life is full of unexpected surprises. If you’re not prepared for these surprises then you’re setting yourself (and your team) up for failure. Another strong component of a strong (financial) defense is an emergency fund. I think that little guy gets forgotten because he’s not as glamorous as his investment fund big brother, but he’s part of the team! #5 – Bring your A game to finances and football. Unlike, England who looks tired and uninterested. #6 – Start strong. Australia played way in their group games against Ghana and Serbia but started the group stage weak against Germany. So start strong – which carries over to money. Isn’t there a heap of stuff you wish you knew when you were 20? How different things would be. @Credit Letter also a great point to start strong……power of compounding can go a long way! Great article man, read about the same thing on Wall Street Journal the other day and all these points prove true. Good work. @Ray – I like that! Being physically and mentally tough enough! Sports and Investing – 2 things I like. Patience is key, and something I still need to develop more off!